Netball is a popular girls’ activity offered at Tom Newby School. Netball was included in the Smart Sport Programme in 2013 and this sport has, since then, seen a marked increase in participation and skills level. Many of our players progress to regional and provincial trials. In 2014 the U13A team won the Benoni league and in 2015, the U9B and U10A teams placed first in the league. 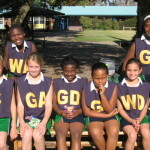 Netball is offered to five age groups of players: U9, U10, U11, U12 and U13. An A and B team, per age group, is entered into the league. Development of netball skills takes place through the Smart Sport Programme and players must be ‘on top of their game’ if they would like to be included in the one of the official league teams. Netball practices are held on school grounds. Days and times of these practices vary according to age group – please consult the Term programme for details. Matches are held at TNS for ‘home’ games or at the opposition team’s grounds for ‘away’ matches. Players are transported to and from venues by school transport if parents are not able to assist in this regard. The first official netball event of the season is the Netball Trials that take place at the end of the first term. The official league season begins in Term 2 and continues to the middle of Term 3. Netball practice requires players to wear the official school PT kit. Tom Newby School provides match kit for the players at official tournaments and league matches. Players are required to provide the following: netball takkies and socks.